The single drawback for slim profile TV’s is poor sound quality; it’s tough to get decent audio from a tiny, skinny speaker. In response, there’s been a proliferation of soundbars recently (check out our soundbar roundup for our some good ones), and Sonos, maker of high-quality household wireless sound systems, recently joined the party. 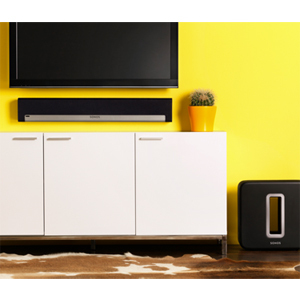 Their entry into the market is the PLAYBAR, a three-foot-long soundbar that sits above, below or even beside your TV. The PLAYBAR connects to your TV via an optical cable, but it can also stream music through the standard Sonos system for playback of local music from your computer, or from Internet sources such as Spotify, Pandora and Slacker Radio. The bar can be controlled by a smartphone or tablet with the free Sonos app. The PLAYBAR, which contains six mid-woofers and three tweeters, is designed to deliver great sound for movies, games and music. The real draw, though, is for existing users of Sonos products; you can very easily pair the soundbar with the Sonos Sub (their subwoofer), or PLAY:3 speakers system and subwoofer to create a wireless surround system. In short, the PLAYBAR can be a good standalone home theater speaker or a terrific enhancement to an already quality set-up. Of course, great wireless sound doesn’t come cheap. The PLAYBAR will be available starting in March for $699 from Sonos. Hey thanks for this review Alex, this Sonos Playbar looks really good. I like the fact they make their products to syncronise well together, whether its the Play:3 or Play:5. One thing I would recommend for anyone to get its the bridge Sonos have made. It will allow you to really use all the devices if you have multiple in multiple rooms while maintaining excellent sound quality. Thanks for the insight.